Matteo Brusa, of the Lombardy region of Italy, has been putting in a lot of work over recent years, building up his name as a dungeon synth artist under the moniker Medhelan. His last major release, Fall of the Horned Serpent, on the Deivlforst label, brought him into the mainstream of the quickly growing dungeon synth community. Now Brusa takes his music in a different direction, and appropriately under a different name. 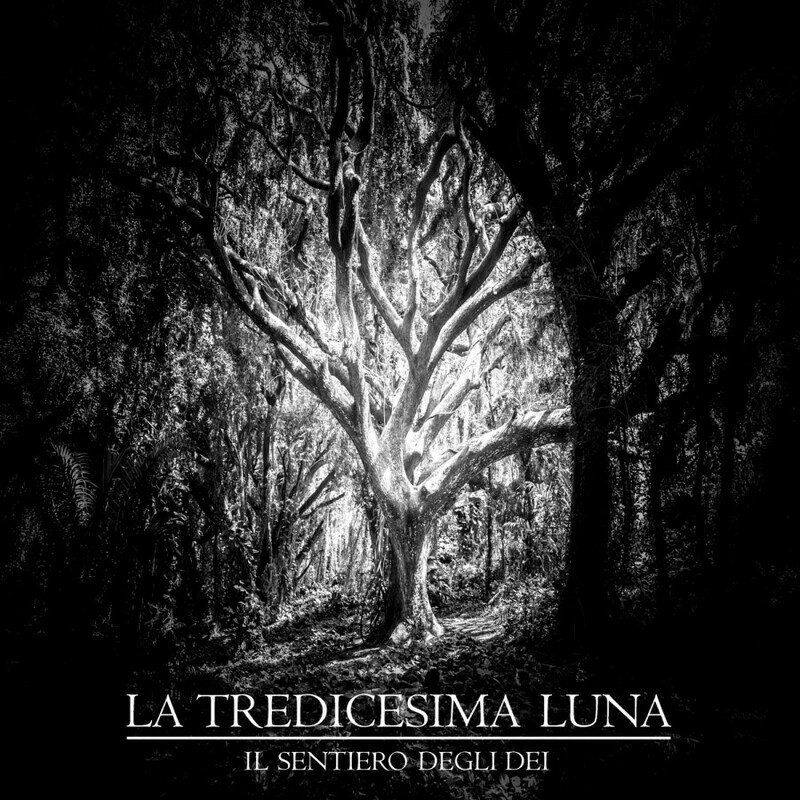 La Tredicesima Luna is his new project which creates music that falls under the dark ambient genre as opposed to his Medhelan releases which are a bit of a mix, but for the most part classified as dungeon synth. La Tredicesima Luna doesn’t necessarily follow the current trends of dark ambient. His sounds reach back to an older era, closer to the beginnings of the genre (even if this was a decade or so after the actual beginning of the genre). On Il Sentiero degli Dei, Brusa seems to have drawn a lot of inspiration from Burzum and the other early black metal acts, when they were first testing the waters of the dark ambient genre in short spurts on their otherwise black metal albums. This connection to the black metal/dark ambient cross-overs seems the most obvious in the second track, “Parte II – Energie ancestrali / La luce dorata dell’aurora”. This track has significant similarities to the final track of the Filosofem album by Burzum, “Gebrechlichkeit II”. It follows a similar chord progression using a similar sounding synth sample. This shouldn’t be a surprise as many artists, particularly of the dungeon synth variety, are quick to point toward Burzum as one of their main influences. Furthermore, many well respected artists in that genre have gone so far as to include Burzum covers on their albums. But, don’t get me wrong about this comparison. Brusa is certainly not looking to just reproduce something that Burzum did roughly 25 years ago. Instead he takes this style as a foundational element and builds onto it with his own ideas to create something that is arguably much more interesting and innovative than was done by Burzum or his black metal contemporaries. Particularly the opening track of Il Sentiero degli Dei brings forth brilliant soundscapes of drones and meandering synth which are complemented by manipulated field recordings. “Parte I – Fuochi sotto le stelle / Tra due mondi” conjures aural images of deep dark forests, filled with all the creatures that one might manifest in a nightmare. There is a consistently dark otherworldly presence emanating from those most haunted and daemonic shadow regions of the Earth and its other conjoined realms. The opener gives us a clear and distinct sense of our surroundings, while the other half, “Energie ancestrali / La luce dorata dell’aurora” gives us plenty of space to brood and meditate upon these dark wonders that we have previously conjured. While the track moves on in a rather static manner for its almost fifteen minute length, it is a testament to the skills and vision of Brusa, that it never manages to feel stagnant or redundant. The release of this album in an ultra-limited edition of 50 professionally duplicated grey cassettes through the Lighten Up Sounds label/distro means that die-hard fans of Medhelan will likely sweep these copies up in a matter of hours/days. This edition will almost surely become a highly sought out physical release over the coming months/years. Brusa has done what I’ve been hoping to see over the last few years since discovering Medhelan. He’s severed the tie of Medhelan between his dark ambient and dungeon synth output and created an entity for the sole purpose of dark ambient releases. As he moves further into the depths of this cataclysm it’s likely that an already polished sound will be even further refined on future releases. We might be seeing the beginnings here of a big deal within dark ambient circles. Brusa has already proven capable of this feat in the dungeon synth community.